Why attend? What you'll get out of training? What your boss needs to know? Expert-led training on IIS 7.0 administration. This training course is meant to examine IIS 7.0 and its features while giving maximum learning potential to new IIS administrators, IIS developers and anyone else wanting to learn about IIS 7.0. It's meant to get you started, expand your knowledge, and can also help you take your skills to the next level. Anyone else who wants to learn IIS 7.0 and already knows Windows essentials will also benefit from the training course. However, it is important that you have some Windows administration or support experience beforehand. Speed and ease of reference is an essential part of this hands-on guide. The book has an expanded table of contents and an extensive index for finding answers to problems quickly. Many other quick reference features have been added to the book as well. These features include quick step-by-steps, lists, tables with fast facts, and extensive cross-references. The book is broken down into both parts and chapters. The parts contain a part-opener paragraph or two about the chapters grouped in that part. Part I “Web Administration Fundamentals” covers the fundamental tasks you need for IIS administration. 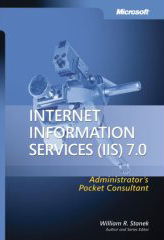 Chapter 1 provides an overview of IIS administration tools, techniques and concepts. Chapter 2 explores core IIS administration. You'll learn about administration components, Windows services, Internet Services Manager and server configurations. In Part II "Web Server Administration", you’ll find the essential tasks for administering Web servers running IIS. Chapter 3 details management techniques for Web servers. You'll also learn how to create and manage virtual directories. Customizing IIS is the key focus of Chapter 4. In this chapter, you’ll learn about ISAPI filters, custom HTTP headers, custom errors and more. Chapter 5 discusses techniques and procedures you'll use to run IIS application and application pools on your Web servers. Chapter 6 extends this discussion to cover Web Service Extensions, including Background Intelligent Transfer Service and FrontPage Server Extensions. Chapter 7 covers Web server security. To manage server security, you'll create user logins, configure directory permissions, and assign operators. The permissions and operator privileges you assign determine the actions users can perform as well as what areas of the Web site they can access. The final chapter in this section explores server certificates and SSL. Certificates are used to enable secure Web communications. Secure Sockets Layer (SSL) is used to protect sensitive information by encrypting the data sent between client browsers and your server. Essential services administration is the subject of Part III. Chapter 9 covers techniques for managing FTP servers. You'll find information on configuring FTP servers, controlling access to directories, enabling anonymous uploads and downloads, and more. Chapter 10 focuses on configuring and maintaining SMTP. You'll find detailed discussions on configuring SMTP servers, organizing messages for delivery, routing messages, message delivery options, and maintaining SMTP server security. In Chapter 11, you'll learn how to manage incoming mail with POP3. The final chapter in this part examines indexing services. You'll learn all about the latest indexing techniques, creating and managing catalogs, tuning performance, and creating index service query forms. Part IV "Performance, Optimization and Maintenance" covers administration tasks you'll use to enhance and maintain IIS. Chapter 13 provides the essentials for monitoring Web Server performance and solving performance problems. Chapter 14 starts with a look at common tasks for tracking user access and then dives into configuring server logs. Chapter 15 explores IIS optimization. You’ll learn how to update registry setting for IIS and how to work with the IIS metabase.